Watching new makeup releases lately, as someone who doesn't love warm-toned eyeshadows, has been a giant snooze-fest. Every single makeup brand lately has been releasing nothing but reds, oranges, and yellows. 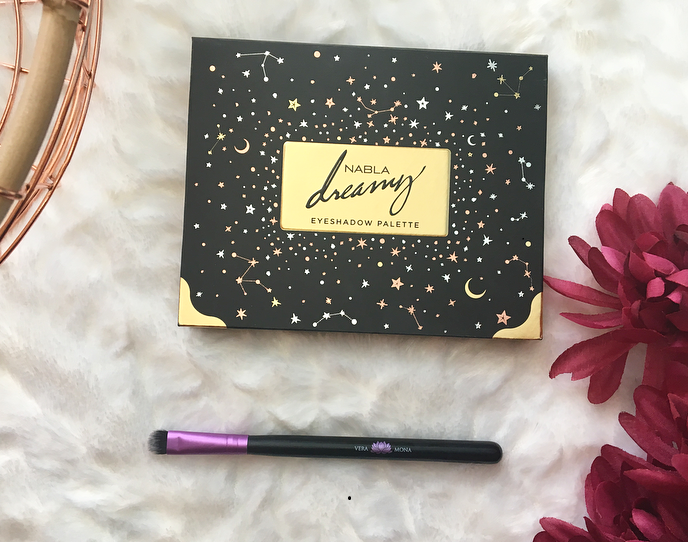 I wasn't excited about any eyeshadow palettes until I saw this absolute beauty from Nabla Cosmetics, and the swatches looked even better! 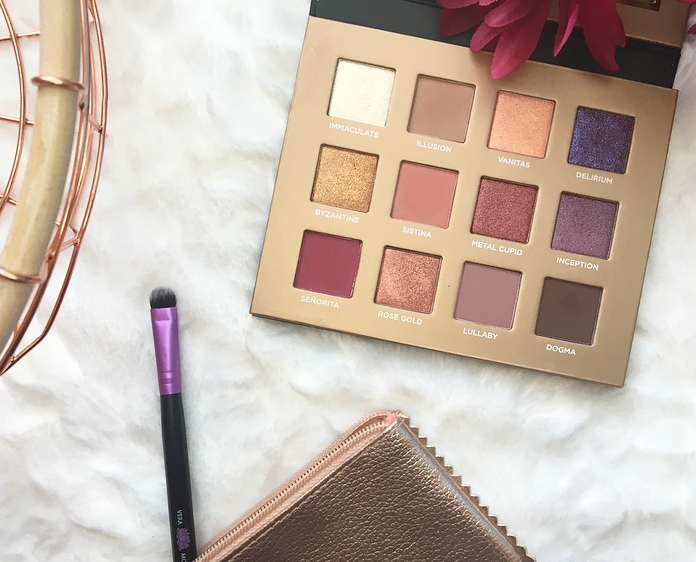 Everything from the packaging to the gorgeous shades included in this palette drew me in. Sadly, by the time I was able to purchase it, it was sold out. But I was first in line when it came back and I have been testing it out for several weeks. To start: the packaging. THE PACKAGING. I have been obsessed with star and constellations designs for months now and this one is just stunning. I adore it. The palette is a decent size, roughly the size of the Tartelette palettes, with 12 shades in a variety of finishes. The color scheme is not too bold, but it has a lot of beautiful purples and raspberry shades that I don't see often in other palettes. The matte shades in this palette are really soft and easy to blend. I like that there are multiple shades that I can use as a transition shade, such as Lullaby, Illusion, and Sistina, depending on what color eye look I want. There are also two darker mattes, Senorita and Dogma, that are great in the crease or to darken a look. However, you do have to be careful with them because they can be a little bit patchy! The shimmer shades are very metallic and beautiful on the eye, but I prefer to use them with my fingers to avoid fallout. There is one glittery shade, Delirium, which is the only shade in the palette that I don't like. I would have preferred a dark matte purple or a matte cream. 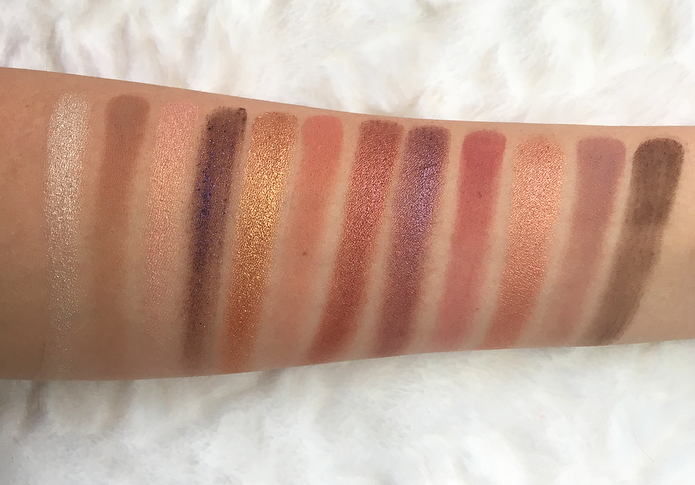 Swatches from left to right: Immaculate, Illusion, Vanitas, Delirium, Byzantine, Sistina, Metal Cupid, Inception, Senorita, Rose Gold, Lullaby, Dogma. Byzantine, Lullaby, Metal Cupid, and Inception are my favorite shades in the palette as they are quite unique and perform really well. I doubt I will reach much for Delirium and Vanitas because I don't like peachy shades or glitter. The shadows all swatch beautifully! I get so much inspiration from this palette, I have a feeling it is going to be one of my favorites. It is on the pricier end, but I don't think you would be disappointed in this palette so long as you would use the colors. I will definitely be watching for more Nabla releases in the future. 8 comments on "Nabla Cosmetics Dreamy Palette Review "
I've seen this brand here and there but never tried anything myself. This palette is beautiful and the pigmentation is really good! I'm not specifically only for warm or only for cold tones, so I loved this palette when it first came out. However, I convinced myself that I don't need another palette (but that may change soon). It looks absolutely great, and even though I don't care much about the packaging usually, this one is just gorgeous! Antihaul #5: What I'm Not Gonna Buy!